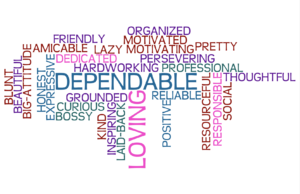 Honest, grounded, thoughtful, motivated, organized, social, laid-back, reliable, positive, professional, dependable, kind, beautiful, persevering, friendly, curious, amicable, resourceful, inspiring, loving, motivating, blunt, expressive, responsible, pretty, bossy, big-attitude, lazy, dedicated, and hardworking. These are all the words used to describe me by my closest friends, family, and coworkers. I directly asked people close to me to describe me in 3 words, in order to compare and contrast how I think of myself and how others think of me. I agree with most of these adjectives. I was very happy to know that most of the people around me had positive and genuine things to say. I feel that these adjectives only represent my positive qualities because they were not anonymous. Not many people are comfortable giving negative feedback directly, which is understandable. I believe that most of the people I surround myself with are close enough to me to let me know if there is something about my personality that is hurtful. I trust that these answers, although a bit skewed, represent my character truthfully. If I could describe myself in 3 words I would say: helpful, determined, and self-aware. I find comfort in helping others, and I take a lot of pride knowing that many people can turn to me when they need help. I chose to describe myself as determined because once I set my mind to something I have to achieve it, no matter the consequences or obstacles in the way. I think being determined is both my strength and weakness. Self-awareness for me is being able to learn from my mistakes, and understanding my flaws in order to better myself. I like to portray myself as someone who always has it together, but I am my own hardest critic and I overanalyze everything I do. I was surprised to see that one person described me as “bossy, big attitude, and lazy.” Although it was meant to be sarcastic, I feel there is some truth in every joke. I appreciate criticism because it helps me recognize things I wouldn’t have otherwise. So I plan on using this as a chance to grow and change. I thank everyone who took time to send me adjectives; it’s always nice to see what people think of me, whether it is good or bad.